To get solutions for your game, you must first enter the game board and your rack into Scrabulizer. Tap on the board to begin entry, the keyboard will appear, and the direction arrow will show whether text will enter downwards or to the right. Tap the arrow to change its direction. Tap the rack to begin entering the rack tiles. If you make a mistake, you can use the backspace key, or select the tile you wish to change and select a new letter. The phone will vibrate if you press an invalid key. The board can be zoomed in/out of using pinch gestures, and then dragged to position. This often makes text entry easier. Alternatively, use a lowercase letter. You can change the dictionary, and also board design and rules to match whichever variety of the game you are playing (E.g Words With Friends, Scrabble, Lexulous, etc). Tap the symbol on the taskbar to open the Settings page, where you can customize the game. Your current game is auto-saved so will be restored each time you open the application. If you wish to create a set of saved games, you can add the current game to your saved games list, by tapping the + symbol on the task bar and choosing a name for the game. To open one of your saved games, tap the symbol on the task bar, and select the game you wish to load. To delete a saved game, swipe your finger from right to left across the game in the saved games list and tap the Delete button that appears. Once you have populated the board and rack, you'll want to generate a list of possible solutions. Tap the "Solve" button in the top-right, and your game will be sent to our solution generator. This requires a network data connection. The list of moves will be shown, with the top move already displayed on the board. Scroll the solution picker to see more about any particular move. Solutions will be ordered by score. Where strategy evaluation is available, the strategic value of a move is shown in parenthesis after the score. You can choose to sort by the score or stragic value by tapping on the respective button under "Sorting". Strategy evaluation isn't available on every dictionary and board design. Once you have found a suitable move, tap "Use Move" to add it to your game. Instead of typing the letters on to the board manually, you can have Scrabulizer read them from an image. 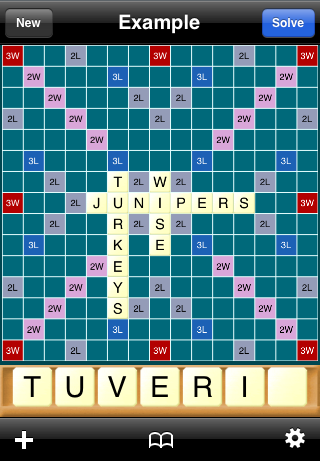 This might be a screen shot from another iPhone application, such as Words With Friends. To take a screen shot, simultaneously press the iPhone's Home button (beneath the screen), and Lock button (on top of the phone). The screen will briefly flash white, and the image will be added to your Camera Roll. You can now load from this image in Scrabulizer. Press the camera icon to load from an image. If you have previously loaded an image, this image will be shown allowing you to refer to it for any corrections that may be needed. Once you have picked an image to load, it will be shown to you for verification. Press "Load" to have Scrabulizer read the image and extract the game information. Scrabulizer needs to be able to see the entire board in order to load it in. Please make sure you zoom all the way out before taking a screen shot of another app. If Scrabulizer is not certain where the board is in the image, you may be shown a green bounding rectangle, the corners of which can be moved into position on the board by holding and dragging. When the game in the image is considered a close match to the game you are currently playing, it will be merged in to your current game, otherwise it will be loaded as a new game. If the image isn't understood by Scrabulizer, you may be told there is "No Interpreter" available, and be given the opportunity to send the image to us. Please do send us these images, as we use them to create and train new interpreters. If the image was interpreted incorrectly, perhaps it got some letters wrong, then you can tap the image when viewing it in the "Previous Grab" screen, and you will be asked if you'd like to submit it.